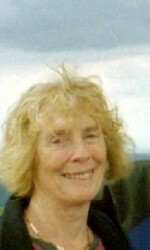 Olivia McMahon, though first and foremost a poet, is also a writer of novels, novellas and text books for English as a foreign language. English of Irish origin, she lived for seven years in France but for the last 35 years her home has been in Aberdeen, Scotland. Diversionary activities, when not writing, include hill-walking (weather permitting), playing the piano and raising money for Amnesty. She is married with two grown up children. These poems are featured in her chapbook Domestic Verses, published in 2005 by Koo Press.